Many Japanese people visit a shrine or a temple during the first days of the New Year. (*) Among several hundred thousand shrines and temples, Meiji Jingu (Meiji Shrine) has attracted the largest number of New Year's visitors since 1979, according to the National Police Agency. 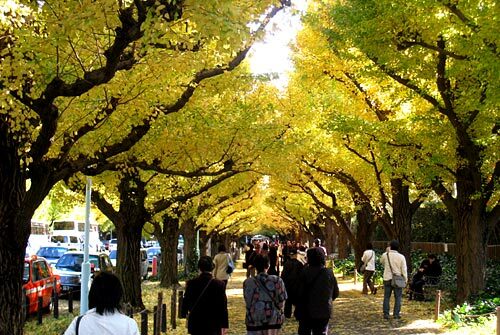 In 2008 some 3.2 million people visited Meiji Jingu in the first three days of the year. (*)You might think that this is an old tradition. No, it is NOT. The New Year's shrine visit became popular only about a century ago, when people forgot the original meaning of visiting specific shrines on New Year's Eve and New Year's Day. The main shrine of Meiji Jingu and torii. 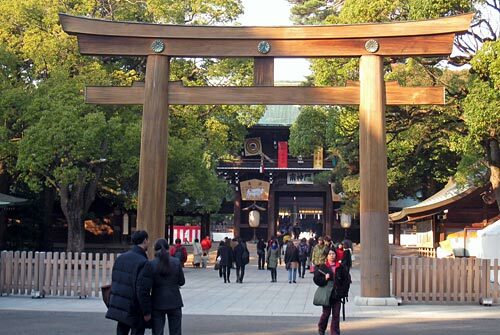 The forest of Meiji Jingu and its north gate with torii. 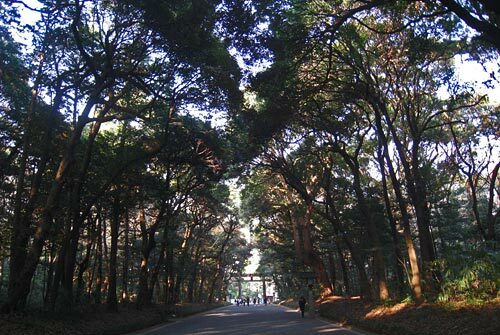 Meiji Jingu possesses a 70 ha large forest area and the quiet environment appears to represent the old Japan, which you cannot find easily in busy and super-modern Tokyo. Therefore many tourists, both from inland Japan and from foreign countries, visit Meiji Jingu in addition to Sensoji in Asakusa. However, Meiji Jingu is in fact one of the newest shrines in Tokyo. Meiji Jingu was dedicated to the Emperor Meiji, who reigned over Japan during the Meiji era (1867 - 1912). The Meiji era was a crucial period for the existence of Japan as an independent country. Japan could fortunately overcome a series of severe international challenges and when the Emperor passed away, many people wanted to commemorate his reign and the era. Among others citizens of Tokyo tried to estblish the grave of the late Emperor in Tokyo where he had moved from Kyoto together with his government and stayed for the entire period of his reign. But, the government cited the so-called last wish of the Emperor and decided to build the grave in Kyoto, the traditional capital where all the previous emperors had been buried since the Emperor Kanmu, the founder of Kyoto in 794. Despite this decision, people in Tokyo did not give up and tried to build a sort of memorial site for the Emperor Meiji. There were long discussions about what kind of institution should be built to commemorate his reign. Building a shrine was not a self-evident idea, because there were few precedents to enshrine late emperors, except for the cases of the Emperor Kanmu(**) and some mythical emperors such as the first Emperor Jinmu(***) and the fifteenth Emperor Oujin(****). The two latter emperors were most probably not real human beings, but gods who were later integrated into the genealogy of the imperial family. (**) "Heian Jingu" was built in Kyoto in 1895 to commemorate the 1,100th anniversary of the transfer of capital to Kyoto. The Emperor Kanmu made a decision to this end. (***) "Kashiwara Jingu" was built in 1890 in a part of the present Nara prefecture and dedicated to the first Emperor Jinmu, who was supposed to have set up his palace there. (****) The shrine the Emperor Oujin is called Hachiman Jinja and there are tens of thousand Hachimans of Hachiman Jinjas all over Japan. There were also doubts about what kind of role the expected shrine could play in light of the fact that the remains of the late Emperor were buried in Kyoto and his spirit was enshrined in Koureiden in the grounds of the Imperial Palace. Many ideas were put forward concerning what kind of institution would be suitable for the commemoration of the late Emperor. When the building of Meiji Jingu was decided, it was explained that ordinary people, who had no access either to the burial mound in Kyoto or to the holy building in the imperial palace, should be given the opportunity to express their thanks to the late Emperor Meiji. 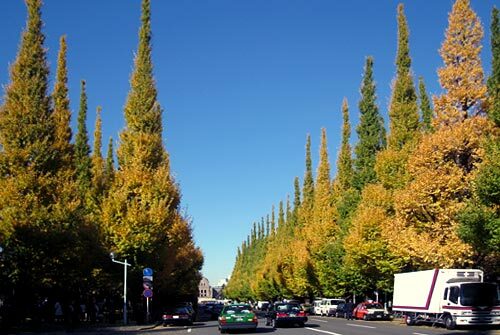 The construction of an outer garden was decided at the same time. 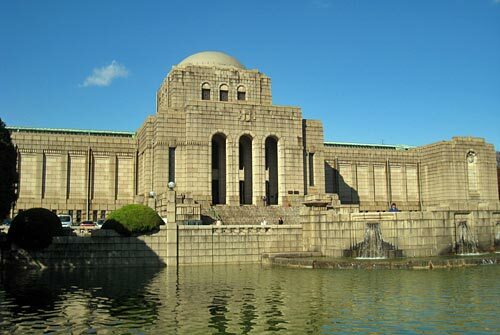 This would accommodate Meiji Memorial Picture Gallery and other cultural and sports facilities, so that the ideas of those people who had different opinions from the official decision could also be realized. Because of these circumstances, the Outer Garden was financed solely by private donations, while the building of the shrine was financed by the government. Before going to the finished shrine and park, I feel obliged to explain about "gods" and the related circumstances in the Japanese native religion "Shinto", because people living in Christianity, Judaism or Islam do not appear to properly understand our polytheistic religion. In our religion, we have no omnipotent god who has created this world and set moral code for the humans. Most probably it was a mistranslation to call our "kami" as "god". According to our myth the elements of our world were created by numerous gods. However, the relations between humans must be regulated by rules created by humans, so to speak moral code. Our gods are, like the Greek or Nordic gods, very human in their character. Not only natural things such as high mountains and strong animals and things which have special importance to our life such as oven and well, but also ancestors or humans who have strong spiritual capability can be awed as gods. They are in essence very angry, harmful, dangerous and awesome supernatural things, who might harm the people's life. Therefore, even you and I can be a god after our death, if other people are afraid of us! Shrines are the place to meet or worship gods. We perform rituals and present tributes to the gods, and get an assurance for peace in return. Therefore, if a shrine was built to worship a dead person, it usually meant that people thought it necessary to tame the angry spirit of the dead person. Commemoration had not been a reason to build a shrine. However, only a few decades before Meiji Jingu, people built Heian Jingu to commemorate the 1,100 th anniversary of the establishment of Kyoto as capital city and together with that the founder of the city, Emperor Kammu. I presume this idea was rather modern in Japan and maybe partly stimulated by the European customs. 19th century was the period in Europe when statues mushroomed. But, Japanese people thought that statues could be easily destroyed when the political situation changed, and that making statues did not belong to our tradition. Then, they came upon the idea of building a shrine to commemorate important persons. But, this is not a usual part of our tradition. There were several kinds of reasoning for building shrines. To worship natural gods. To worship ancestors. To tame the angry spirits of politically persecuted persons. In any case, as I mentioned before, shrine is traditionally directed to angry, harmful and awesome supernatural things, who might harm the people's life. Meiji Jingu was opened on 1 November 1920. The forest of Meiji Jingu looks like a virgin forest, but in reality 12,000 trees of 365 different species were donated by the Japanese people all over the country and planted at the time. The main buildings of the shrine were burnt down by the American air raids on 14 April 1945, but restored in November 1958. 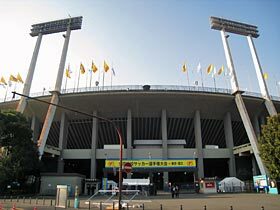 The Outer Garden came to be equipped with numerous sports facilities including the National Stadium, which was the main site of the Tokyo Olympic Games in 1964, and has gradually become a center of youth activities. However, the centerpiece of the Outer Garden remains to be the Memorial Picture Gallery, which accommodates 80 paintings that describe the important events during the reign of the Emperor Meiji. They eloquently explain how Japan could build a modern centralized state out of a federation of some 260 small kingdoms within a short period and could catch up with the advanced Western countries.